The Arctic Blue 37 RIB is a striking craft, with a long low profile forward cabin complemented by an elegant wrap around windscreen which is capped by a heavy stainless steel surround, featuring a useful grab rail on its inside radius. The cockpit comprises a two-man deeply contoured seat to starboard, featuring electric seat bases that can be raised for seating, or lowered for standing in racing style and an L shaped bench type rear seat that can accommodate four or possibly five adults. radar arch mounted amidships and aft of that is the engine box which is upholstered to make a comfortable looking sun bed. There is a GRP moulded, teak covered bathing platform that extends out over the out drives and this features a fold away bathing ladder. Powered by a pair of Volvo Penta D6-370 hp 5.5 Litre diesel engines with only 133 hours. 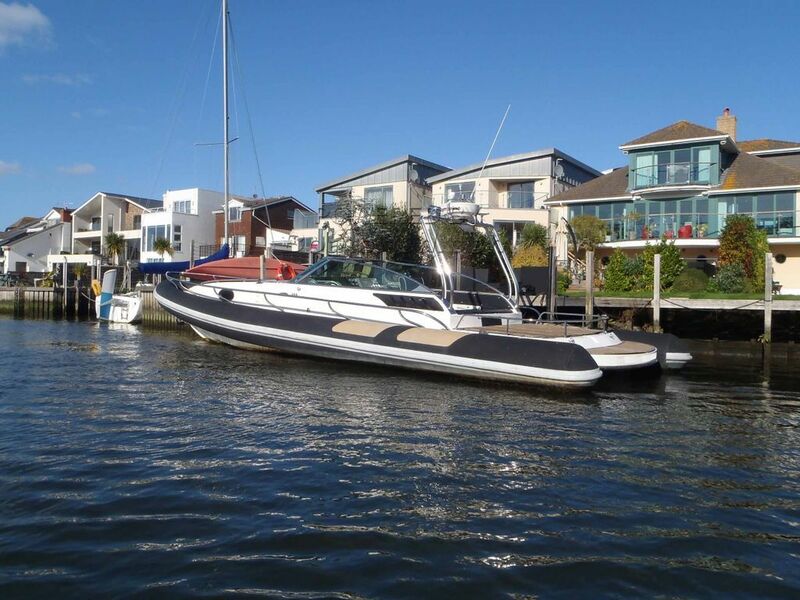 This Arctic Blue 37 Cabin Rib has been personally photographed and viewed by Anthony Silver of Boatshed Lymington. Click here for contact details.